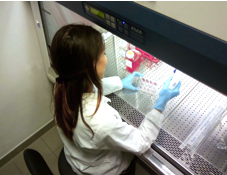 The Department CIBIO Cell Technology Facility offers the resources and the expertise to improve the understanding of life science through advanced cell technologies, finalized to the generation of in vitro tools able to model diseases and pathologies. It integrates the various research interests of CIBIO’s members, providing customized services, such as scientific support, assistance for project design, training activities, data analysis or experimental execution, in order to facilitate the access to cell reprogramming and genome editing technologies. Somatic cell reprogramming finalized to the obtainment of customized induced Pluripotent Stem Cells (iPSCs), eventually differentiable in all the mature cell types. Set up of protocols for stem cell differentiation in two- or three-dimensional culturing conditions. Genome editing platforms, in order to produce specifically engineered cell lines, carrying the desired deletions, insertion, mutations or tags.